Cutting edge length: 7.00 in. 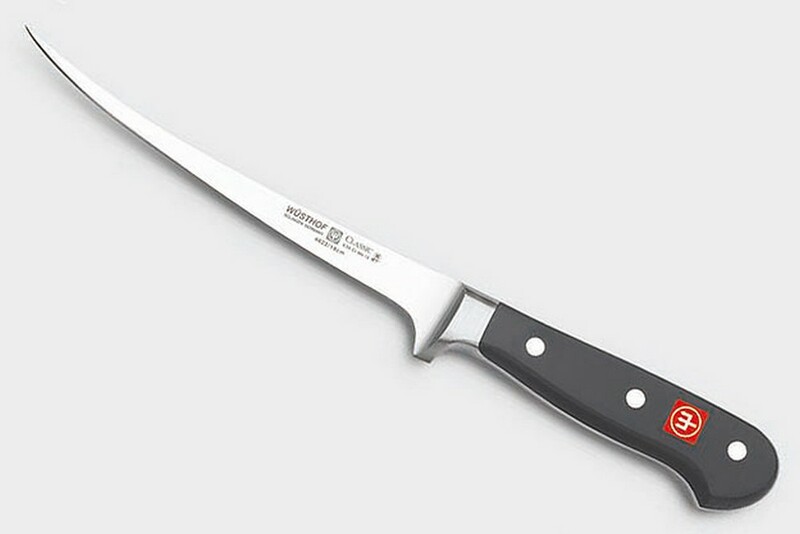 Description: Wusthof's flexible fillet knife is ideal for use both in the kitchen and when fishing. This gift set includes both the knife and a leather sheath for outdoor use. The thin, flexible blade is ideal for cutting around fish bones. The Wusthof-Trident Classic knife is hot-drop forged from a single blank of high carbon no-stain steel in Solingen, Germany. The use a specially alloyed stainless steel, consisting of exacting proportions of carbon, chromium, molybdenum and vanadium, results in a superior edge. The riveted handle is molded from POM and is impervious to demanding kitchen and outdoor environments. 0.3125 0.171875 312.5 171.875 Trailer Completed.